Young Bernice Summerfield (Emily Laing) is living outside the system but taking advantage of their grounds and electricity as she tries to teach the students what they really need to know. But when strange lights appear in the sky, so does a stranger called Wintergreen (Lisa Bowerman) who seems to turn up wherever Benny is. This is the perfect set to start off with young Bernice experiencing an event already fabled from the story’s told about her so far. We also get two Benny’s for the price of one, but we don’t know why the Benny we are more familiar with is there to begin with. It’s a lovely story and finding out that Laing has previously worked with Bowerman is no surprise as their chemistry and the way they both portray Benny is pitch perfect. The script from Goss is really engaging and although it tells a story we already know, it feels new and adding the element of time travel always opens up the possibility things could change, or may have already. Benny finds herself flung through time by her ex husband and current source of feelings-based confusion Jason (Stephen Fewell). It’s 2050ish, the Grel are invading and Bernice is almost glad of the distraction. Of course it wouldn’t be a look back at the history of this character without a Jason story and the Grel is a great monster to use. They seem very bafoonish with their “good fact”, “bad fact” talk (which does lead to some nice comedic moments) but this doesn’t distract from how evil and destructive they can also be. The relationship and complications with it between Benny and Jason are greatly exemplified by Rayner’s writing. Irvine Braxiatel (Miles Richardson) is engaged and Bernice doesn’t know if she should mistrust his new fiancé Veronica (Gabrielle Glaister) or Brax himself. I mean, it couldn’t just be love… could it? Another great example of a story that exemplifies the time in Benny’s life and her relationship with the people in it at the time. Braxiatel was always a character who had more going on than he let on and his relationship with Benny was always complicated. So having a situation where Benny is suspicious of him and a new fiancé fits perfectly. She on one breath wants to save him if he is in danger, but also wants to save others from his need to control and collect anything that takes his fancy. Glaister is wonderfully ambiguous as someone who is clearly charming but could be using this to ‘play’ people. Benny is faced with another version of the Doctor she hasn’t met before… what else is new? Well, this one seems a little more brash than usual even for the Doctor and is after Benny’s help to dig up some ruins for the secret of eternal life…but why? It’s no spoilers (as you hear his voice right at the beginning) that we are dealing with the Valeyard (Michael Jayston) here. To have Bernice meet the Valeyard is everything we didn’t know we always wanted. At their first meeting he isn’t giving the game away, only letting Benny know he is the Doctor. He just doesn’t mention he is a discarded evil splinter of the original. Benny slowly realising who he is as his mask slips is something wonderful to see unfold. Jayston and Bowerman have a great chemistry, both as they work together and eventually find themselves at odds. Benny and friend Ruth (Ayesha Antoine) land on a world that seems to think Ruth is their long lost God by the same name. An idea that a Ruth rather takes a shine to and soon becomes Empress of the world. Great thinks Benny, she can use this position to help them off this world, assuming that is, she wants to. This is a point in Benny’s timeline I’m less familiar with. So it is a credit to Llewellyn’s writing that I understood the set up of this team straight away. Benny has garnered a sort of companion but one that is perhaps a little tired of playing second fiddle to Benny. So thrusting them into a situation where Ruth is made higher status creates a nice drama between them. And who wouldn’t be tempted when you are offered to rule a world? Obviously things turn out to not be as they seem but the relationship between them and a challenge to it is nice. Annis is an archeology lecturer from a people who’s place in history is being written out. If she keeps her mouth shut she might be able to keep her job at the expense of her history, but can she keep quiet? No one wants to listen to her except for a mysterious professor (David Warner) who usually spends most of his time in his office but suddenly is turning up at the worst possible time for Annis. As you may have guessed Annis is Benny (or someone who sounds a lot like her) but we don’t know why or what is going on or why the unbound Doctor is there advising her but not getting involved. But soon you get so lost in this tense story you don’t really care. You want to know if Annis will be safe, only added to by knowing in some fashion this new character is really our Benny. It is somewhat strange having a story of Benny being someone else in a set celebrating her characters arc, but we still get to experience her with the unbound Doctor in the most recent set up of her adventures. This set really just goes to show what a long tale and complex arc the character has had and all the range Lisa Bowerman brings to the role. Without the inclusion of the 7th Doctor, this just goes to show how this character doesn’t need any given Doctor, even though it is a treat to see her work alongside two here; one brand new to her in the Valeyard. It’s far too easy for a show to exist with the same set up but all the changes to the Summerfield line up and the different lives she has lived suit the character perfectly and have kept us hooked for the last 20 years. It was a great legacy Paul Cornell left from the origins of the character but he was very wise, as revealed in the extras, to leave it open to other writers to keep the character as a living, evolving entity. 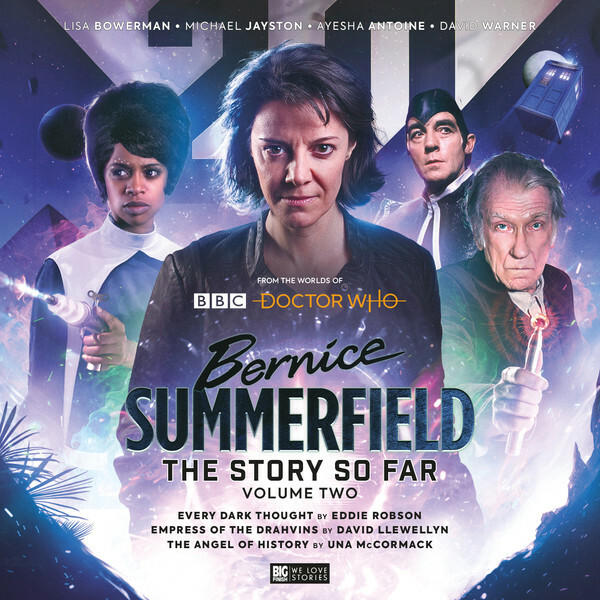 Speaking of the extras it’s also a really fun device to have Braxiatel himself being our guide to the history of Bernice Summerfield with new interviews and archival audio. Also major props to director Scott Handcock for bringing the stories in this set to life. We can only hope for another 20 years with Doctor Who’s original archeologist.